Welcome to Star Lake Fishing Resort near Clearwater, BC, where we offer five bright, clean housekeeping cabins, along with ten private campsites. 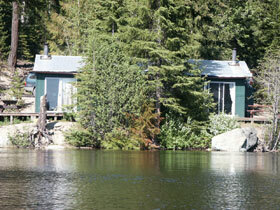 Three of the five cabins, and four of the campsites, are right on the water's edge. 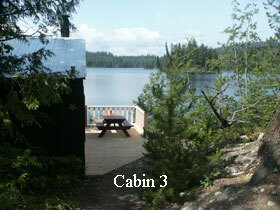 All five cabins have a fantastic view of the lake. Four of our campsites have their own private decks. 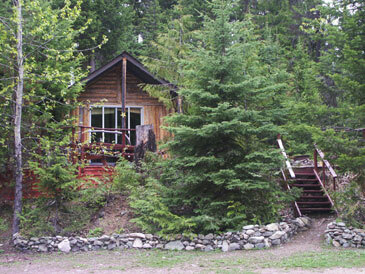 Housekeeping cabins are equipped with propane stoves, fridges, and lights and have a woodstove for heat. Each cabin has its own firepit and picnic table. Beds are made up with a fitted sheet & pillows in cases. Guests should bring their own bedding or sleeping bags & personal towels. We can provide full bedding & towels with an additional charge. Cabin #1, "The Fishing Hole", is our premium cabin. This log cabin sits out on a rock point. It is surrounded by water on three sides, and is nestled in its own little forest. It's the ultimate in privacy. 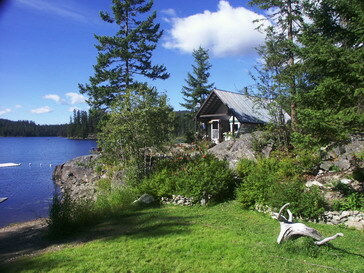 Cabin #2 is a charming log cabin overlooking the lake. With 3 campsites on the same level, it is an ideal location for family gatherings. Cabin #3 and Cabin #4 sit right on the water's edge. The lake comes up to within two feet of their decks. Park your boat right at your cabin door. 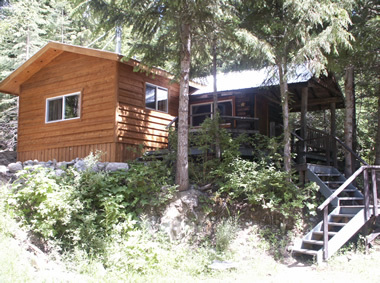 Cabin #5, "The Hideaway" is a rustic log cabin nestled in amongst the trees. It has a romantic private setting and a fantastic view of the lake. Any stay of seven days or more automatically gets a special weekly rate. All cabin rates are based on two adults. Each additional adult is $10.00 per night extra, and each additional child (under 16 years of age) is $5.00 per night extra. Children under age two stay free. Prices subject to change. 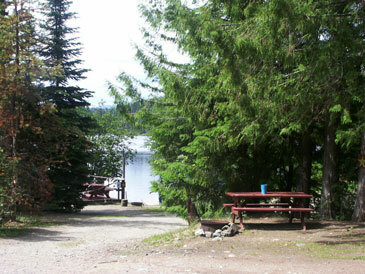 Waterfront Campsites (Sites 1- 5) are $31.50/night and Campsites 6-10 are $25/night including tax per unit. Based on 4 people. Each campsite has its own firepit and picnic table. For the campers there is a central showerhouse with washrooms and showers. 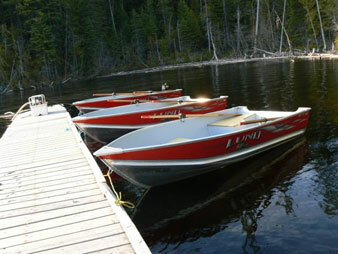 Star Lake Resort offers complete boat rentals. The fiberglass canoes are unsinkable, and the new clean, safe, aluminium boats are exceptionally stable. Life jackets in all sizes are provided for your safety and comfort. A maximum of 10 HP is permitted on Star Lake. Boat Launch: $10 (plus tax) - under 10 hp only. A VISA or Mastercard is required at the time of booking to hold your reservation. Remember Star Lake is off the power grid.